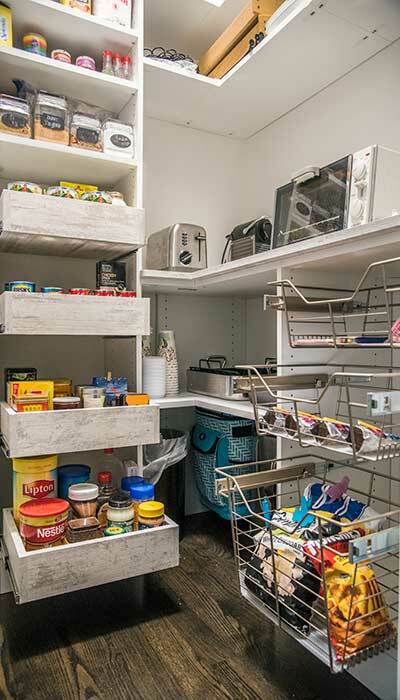 This small walk in pantry shelving system includes storage for all the household foodstuffs, plus countertop space for the toaster, toaster oven and other small appliances. The addition of shelving for a specialty beverage center transforms this small pantry room into a multifunctional space that doubles as a butler's pantry. Additional walk in pantry organization ideas include the pull out baskets, shelves and vertical tray organizers with scalloped front. Note how the top shelf of the shelving system is located more than a foot below the ceiling — this allows for storage of oversize items that would not otherwise fit on the shelves. It is also a good place to store rarely used appliances like the bread machine, picnic baskets, etc. Walk in pantries were once common in old farmhouses across the country and in many vintage homes. They fell out of favor for many years as homebuilders concentrated on the kitchen cabinetry surounding the sink, refrigerator and stove as the primary location for food storage. Many walk in pantries were torn out of older homes in favor of a new powder room — as both of the rooms are a similar size and the nearness to the kitchen water lines made this a common kitchen renovation. Walk in pantries have made a comeback, however, and homeowners now crave this amenity for their kitchens. Many new homes now include a walk in pantry in the kitchen design. 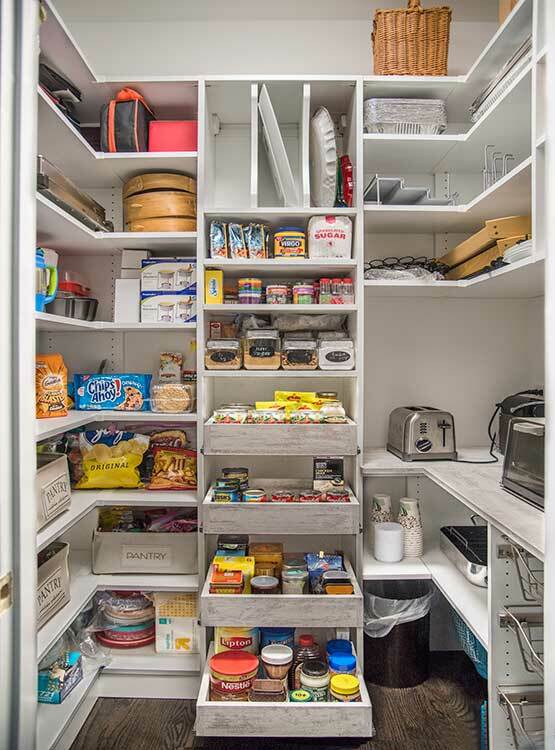 This three-sided walk in pantry is relatively small — about the size of a typical powder room — but includes many of the coveted features todays buyers desire in their kitchens. Fourteen inch deep shelves run floor-to-ceiling on one side of the room, handling the bulk of the food storage. 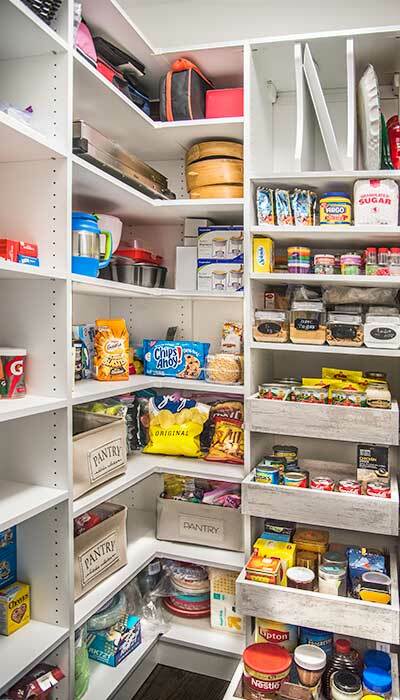 A central tower along the back wall is designed to organize all the small packaged foods on pull-out pantry shelves, ensuring that everything is easily seen and nothing gets lost in the back of the pantry closet. A vertical tray organizer above the pull-out shelves holds all the cookie sheets, trays, cutting boards and broiler pans that are so difficult to find storage for in the typical kitchen. 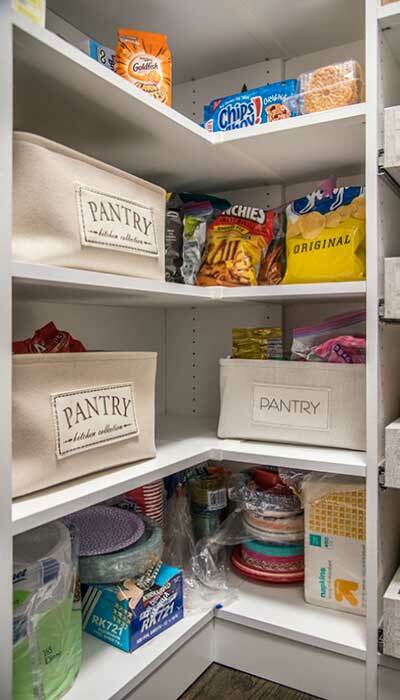 The remaining wall offers even more pantry organization goodies for the homeowners. Three pull-out wire baskets were included to organize root vegetables and bulky bags of chips. The storage shelves on this side of the pantry are dedicated to providing easy access to small appliances. A built in countertop with electrical outlets offers a convenient place to use all these appliances — like the toaster, toaster oven, blender, electric fry pan and more. A plethora of small electrical devices is a bane to modern kitchens, creating a lot of clutter on the countertops. 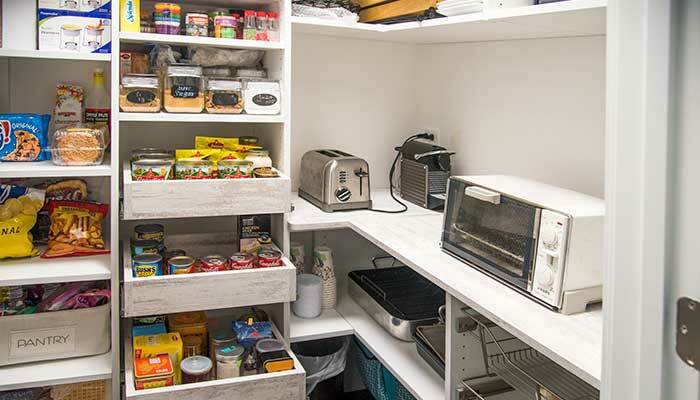 This small walk in pantry, however, solves that issue by offering a place to both store and use these items, ensuring the owner's home stays neat and tidy. Easy to clean plastic wire basket liners were included on the bottom of all baskets. They keep onion peels and other small things from falling through the wire to the floor, without disrupting the air circulation needed by the onions and potatoes.